This isn't easy for me to admit: I can't do everything. Seems obvious. Shouldn't come as a shock. But it's still hard for me to admit. I have always been a "Type A Overachiever". And when I say that, I'm not exaggerating. Not one little bit. In school, I was a straight A student. I had about 1 gazillion extra curricular activities (give or take a few). So here I am. Years later. A single mom with my own home. Wait...let me clarify that....an INTERIOR-DESIGNER-single-mom with my own home. That means, of course, that I have grand plans for just about every nook and cranny of this house. Here's where I've had to learn that I can't do everything. In the past, I would have just made a "to-do" list and started tackling it one item at a time. Now, I work full time as a designer, part-time as a design blogger and 24-hour-a-day-time as a mom. That leaves little time for projects. So I did the unthinkable (unthinkable to a type-A, DIY, Design blogger anyway). I hired a project done. And I know it won't be the only project that gets accomplished this way. And you know what? That's okay. And I couldn't be happier. And neither could my boys. I took on the painting of said project to save a bit of money...and now I realize that even fitting in painting is challenging with my current schedule. I've been working on it for 5 days now, and I'm not done. Meanwhile, the boys are camping out in the living room. An arrangement that they think is fun. But one that I'm ready to have over with. Every new phase of life teaches us something about ourselves. In this phase, I've learned that I can do ANYTHING I put my mind to, I just can't do EVERYTHING. There is quite a distinction. And in learning that about myself, I've freed up some of the guilt. It's okay (even as a type-A, DIY, Design Blogging Interior Designer) to ask for help when you need it. And that, my friends, is growth. Learning my limitations has actually expanded my abilities in a way. Who woulda thought? I'm so glad you decided to hire that out. Being raised by a single mom, I know that they do everything they can for their kids and stretch themselves trying to do it all. You deserve to have one checked off the list without all of the stress of trying to DIY something that big. If I lived closer, I'd come over and help ya paint it too. I'm one of those weirdos who loves to paint! So kudos to the single mamas making life better for their kiddos! Well Wendy - this post could have been about me - it's a very difficult thing to let go of the notion that we can do it all - ( I think most bloggers fall under this category by the way lol ) but how liberating once we've come to terms with it! 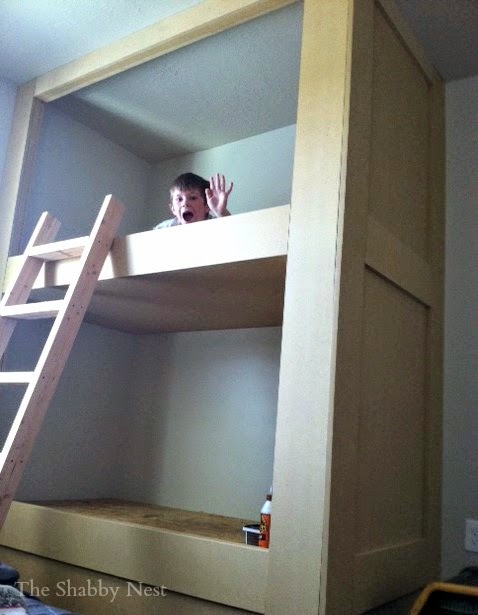 Those bunkbeds look absolutely fabulous - can't wait to see them painted.